It's totally awesome - not disjointed at all in my opinion. I love the colors and that background with pops of orange. I'm sure anxious to get back to my rug. I think yours will be just fine. Keep hooking! rug, only distracts. the background should always be just that...a background. the eye should travel around the rug, not be distracted by sharp contrasts of color. the use of textures close to the background color would help create movement...or take the orange and similiar wools and bleed them with a black or grey to really darken and dull them down. this way they will retain their own color but be so close to the darkest value that the eye will acknowledge the change and all will be a pleasing visual effect. 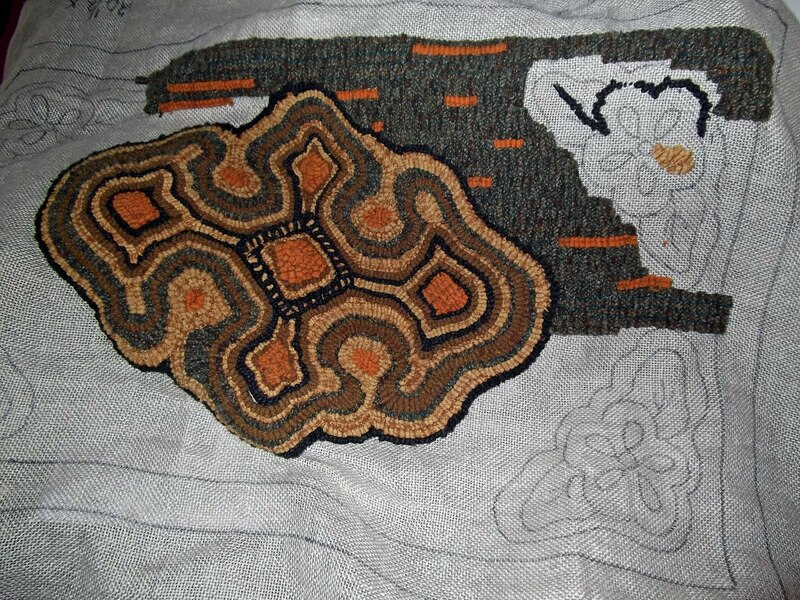 I love the center motif, and was going to tell you that I think the splashes of orange on the background will probably bring it all together nicely if your corner motifs are also bright. I think touches of design and color in a background provide more interest. Keep doing what you're doing and keep us posted with more pictures. The idea for the bright orange "worms" comes from the sample rug June Mikoryak had in class - if I remember correctly, her background was red with yellow strips, but I may be wrong. I'll have to check the photo - maybe I can post one, too.